9ct white gold and created sapphire round and square ring. A sleek 9ct white gold ring set with three lustrous created sapphires, framed either side with a single glittering cubic zirconia. An oval created sapphire takes the centre, framed either side with square cut for a fresh, contemporary finish. 9ct white gold and created sapphire round and square ring. is rated 4.2 out of 5 by 6. Rated 5 out of 5 by Anonymous from Absolutely stunning ring! Really gorgeous ring, quite dainty and lightweight to wear everyday. She loves it! Rated 5 out of 5 by Anonymous from Lovely Ring I bought this as an engagement ring for my girlfriend. It's a beautiful small ring. Not too big or flashy. Lots of people wear big tacky 'look at me rubbish' this is small, pretty and has a real element of class. 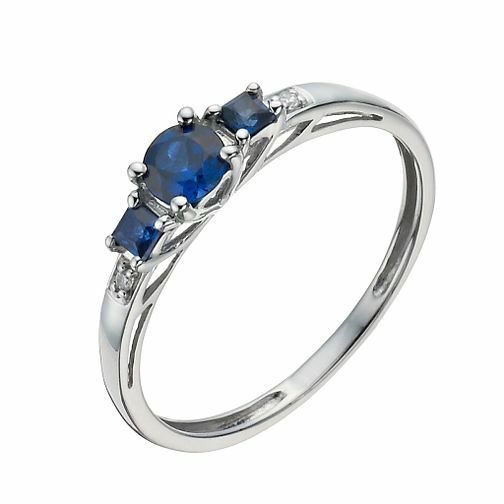 The beautiful white gold and deep blue colour sapphires compliment each other beautifully. If you have a girlfriend who isn't very large (my girlfriend is only 5ft 3in) so it doesn't look overpowering. She loves it and I love it. Would 100% recommend. Very fast efficient delivery too!